Professional volleyball star Nadine Zumkehr shares her thoughts on Swatch's new smartwatch made specifically for her sport. Professional volleyball player Nadine Zumkehr knows watches. “I’m Swiss, so being a watch enthusiast is in my blood,” she tells SI.com. 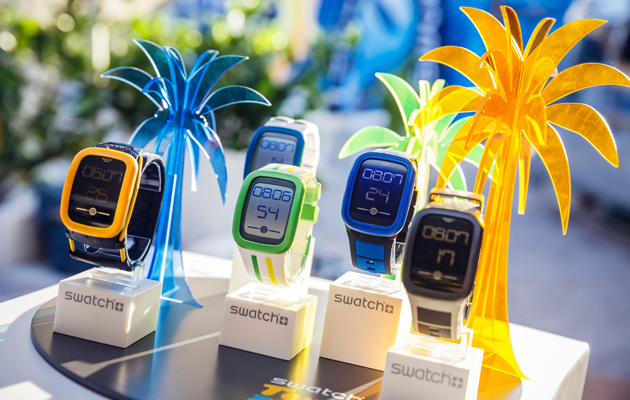 So when Swatch introduced the Swatch Touch Zero One, a connected watch geared specifically for beach volleyball, Zumkehr took notice. The idea of the Touch Zero One is to connect fans and players by tracking everything from hits to steps to claps—an obviously fan-centric addition—and allowing wearers to digest it all via a smartphone app. Zumkehr says while she’s thrilled Swatch is celebrating her sport, she also enjoys measuring the number and intensity of her power hits. “It is fun having a beach volleyball companion that I can use to monitor parts of my performance on the court, whether in training or competition,” she says. But then there’s the functions that tie the fans to the game, whether the “cool clap-o-meter” or simply a step counter to monitor calories burned. Zumkehr uses the digital-tracking technology during training and competition—it is common for beach volleyball players to wear watches in-game—to “control my performances and the load concerning the hits.” She especially enjoys the ability to breakdown her different types of hits after an on-court session. Whether in the gym or on the sand, she’s tracking her movements. During the winter, when she’s not involved in competitions, Zumkehr still spends nearly twice as much of her workout time on sand versus the gym. “Some of the gym sessions are combined with some exercises in the sand, so working out in the sand is definitely the biggest part of my training,” she says. For someone who trains like clockwork, she’s quintessential Swiss. Tim Newcomb covers stadiums, sneakers and technology for Sports Illustrated. Follow him on Twitter at @tdnewcomb.